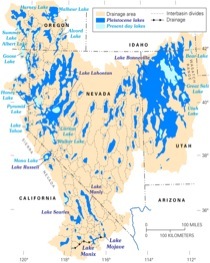 Lake Bonneville was the largest of the late Pleistocene lakes in the Great Basin of western North America (Fig. 1). It occupied the basin of modern Great Salt Lake and was hydrographically closed during its transgressive and regressive phases (the time periods when the lake was rising, and falling, respectively, as shown in Fig. 2). The lake was hydrographically open, or overflowing, during its higher phases (>300 m deep at its maximum) (Fig. 2). The entire history of Lake Bonneville spanned more than 15,000 years. Well-preserved shorelines and deposits of Lake Bonneville are found throughout the lake basin. 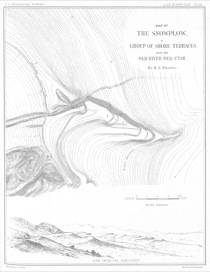 A prominent geomorphic feature called "the Snowplow" by G.K. Gilbert (1890) (Fig. 3) displays characteristics that are typical of many of the shorezone landforms of Lake Bonneville. The Snowplow is located in the central part of the Bonneville basin (Fig. 4). Gilbert noted the resemblance of the landform's shape to that of a snowplow, and thus gave it that name. In understanding the origin of the Snowplow it is important to remember that Lake Bonneville was hydrographically closed during its transgressive phase (which, in the altitude range of the Snowplow, lasted from roughly 21,000 to 18,000 years before present; Fig. 2). The lake reached its highest altitude and formed the Bonneville shoreline between about 18,000 and 17,400 yr B.P., then dropped 100 m catastrophically during the Bonneville flood (O'Connor, 1993; it was a tremendous flood along the Snake and Columbia Rivers, downstream from Lake Bonneville -- within the lake basin, all the water between the Bonneville and Provo shorelines rushed out of the basin very quickly, maybe within a month, and lake level fell rapidly). After the flood the lake stabilized at a bedrock threshold (Red Rock Pass; Fig. 4), and continued to overflow until about 14,500 yr B.P., while it formed the Provo shoreline. In post-Provo time, the climate became drier in the basin and the lake dropped below its overflow threshold. The Snowplow consists of a stack of V-shaped gravel barriers, most of which were deposited during the transgressive phase of the lake. The lower-altitude V-shaped barriers are older than the higher ones. Gilbert referred to V-shaped barriers as "V-bars," and speculated that they were typical products of shorezone depositional processes in closed-basin lakes in the Great Basin. He did not know of any examples of modern V-bars, but since the 1890s, coastal geomorphologists have referred to similar features in marine and lacustrine settings as "cuspate forelands." In the case of the Snowplow and many similar features, the name V-bar is probably not appropriate in modern usage because a bar is a feature that forms in a submerged offshore setting, whereas a barrier crest is higher than the mean water level. The "V-bars" in Lake Bonneville are probably all barriers rather than true bars, so we refer to them as "V-shaped barriers" to preserve some of Gilbert's original terminology. Study the maps and images provided with this vignette (Fig. 5) to identify the V-shaped barriers produced at different lake levels during the lake's transgressive phase. The exact mechanisms involved in the formation of the V shapes are not fully understood, although it is clear that longshore transport of gravel was involved (longshore, or along-shore, currents are set up in the wave zone by waves striking a coast at an angle, and the currents are strong enough to transport gravel). In a closed-basin lake the water level is not held constant, so that if the lake level were to rise at a rate of several meters per year, and longshore currents were transporting large volumes of gravel from adjacent alluvial fans, the depositional landforms would be barriers or spits that were higher (measured from the base of the gravel to the crest of the barrier) than similar features formed in lakes with stable water levels. One of the major unresolved questions in the case of the Snowplow is whether converging longshore currents, from the south and from the north, might have produced the V-shaped barriers. In addition, the cause of the deflection of the longshore current or currents away from the coastline to produce the "V" forms at the Snowplow is not known, but whatever the mechanism was, it was effective at all altitudes higher than the Provo shoreline. How does the Provo shoreline fit into the story of the Snowplow? From basin-wide studies of Lake Bonneville it is clear that the Provo shoreline formed after the Bonneville shoreline had formed. 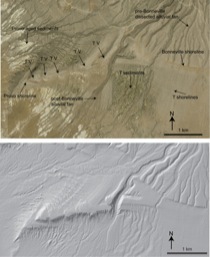 Because of the rapid drawdown of the lake during the Bonneville flood, there was insufficient time to allow shoreline formation, comparable to the transgressive-phase shorelines in this area, in the vertical interval between the Bonneville shoreline and the Provo shoreline. The Provo shoreline platform is cut into the stack of V-shaped barriers that had been deposited during the lake's transgressive phase. Future field work at the Snowplow might help answer the question of the direction(s) of longshore transport. Field investigations could include ground-penetrating radar surveys to determine the orientation of foreset bedding, and therefore the direction of longshore transport, in different parts of the barrier complex. In addition, the lithologies of gravel clasts would provide clues to the provenance of the gravel and direction of transport, and grain-size analyzes might give evidence of the strength of currents and/or storms. Google Earth® could be used to study the Snowplow and other shorezone landforms of Lake Bonneville (for instance, take a look at the unnamed V-shaped barrier at the Bonneville shoreline just north of the Snowplow; 39° 54' 40" N. Lat. ; 112° 46' 45" W. Long.). Gilbert, G. K., 1890, Lake Bonneville: U.S. Geological Survey Monograph 1, 438 p.
Morrison, R.B., 1991, Quaternary stratigraphic, hydrologic, and climatic history of the Great Basin, with emphasis on Lakes Lahontan, Bonneville, and Tecopa, in Morrison, R.B., ed., Quaternary Nonglacial Geology: Conterminous U.S: Boulder, Colorado, Geological Society of America, p. 283-320. Oviatt, C.G., Currey, D.R., and Sack, D., 1992, Radiocarbon chronology of Lake Bonneville, eastern Great Basin, USA: Palaeogeography, Palaeoclimatology, Palaeoecology, v. 99, p. 225-241.